FEBRUARY 16, 2013 POST SEASON MEETING AT KEALAKEHE H.S. JANUARY 19, 2013 WRESTLING AT HPA AND PAHOA H.S. JANUARY 26, 2013 WRESTLING AT KAMEHAMEHA AND HONOKA’A H.S. FEBRUARY 2, 2013 WRESTLING AT WAIAKEA H.S. FEBRUARY 9, 2013 WRESTLING AT KEA’A U H.S. FEBRUARY 16, 2013 BIIF CHAMPIONSHIPS @ KEALAKEHE H.S. ROUND CONTACT POLICY FOR PRE-SEASON WORKOUTS. WRESTLERS MUST HAVE A CERTIFIED DESCENT PLAN IN ORDER TO COMPETE. KEITH TOLENTINO HONOKA’A H.S. (808)775-8800X237 CELL(808)987-8505. 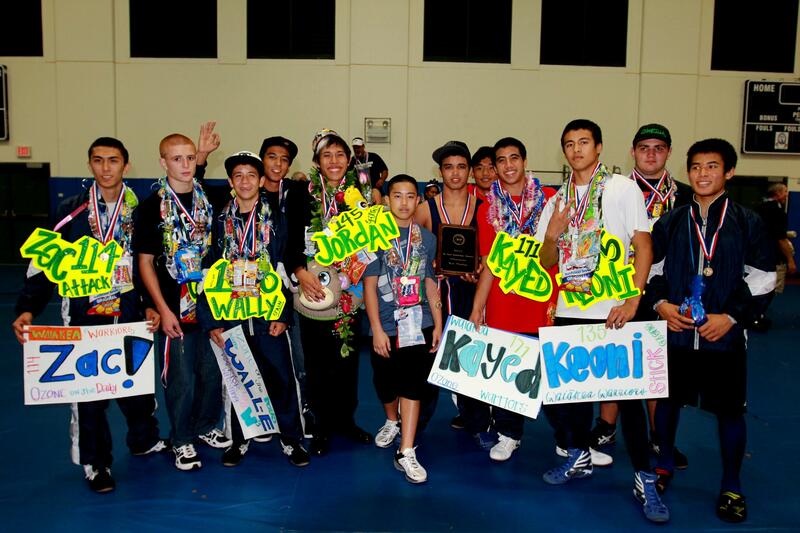 The Waiakea boys and Kamehameha girls won the BIIF wrestling team titles in 2012. 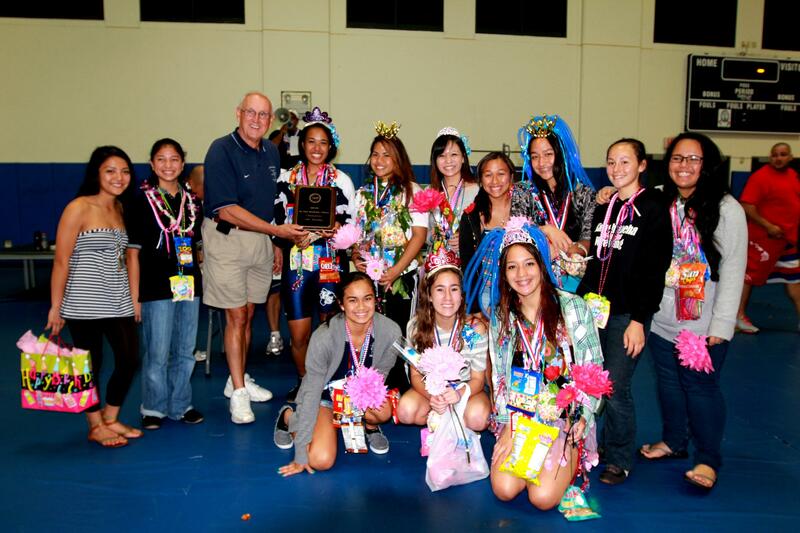 Team photos were taken following the BIIF championships held at Kamehameha on Feb 18 by Charles Aina. Three Big Island Interscholastic Federation wrestlers had a shot at making history during Saturday’s Hawaii High School Athletic Federation state championships held at the Blaisdell Arena on Oahu. Kamehameha’s Akoakoa Paleka-Kennedy the defending state heavyweight champion, Konawaena’s Sage Aoki, 120, and Keaau’s Cheyden Quiocho, 135, all took center stage to wrestle for a state championship. In the final championship match of the day it was Paleka-Kennedy needing to get by Molokai’s Spencer Basa in order to repeat as state champion as the two largest boys, 285, in the championships took to the mat. Paleka-Kennedy won the championship finale by a score of 5-2 earning his points on an escape, a takedown and on technical points when the referee called Basa for stalling. Paleka-Kennedy ended his high school athletic career on top as he will shift his focus on other things. The Warrior senior earned his way into the finals by winning four matches, three by pin and the other on points. “I will concentrate on football and academics for the rest of the year as I prepare to attend Arizona Western of a football scholarship,” he said. Aoki, a senior, looked at facing Maryknoll’s Brendan Chang to earn his first ever state championship. Aoki went the full three rounds in the finals to earn the victory by a 3 to 1 score. “I got a take down in the first period using a single leg to earn two points then in the second period got another point when the ref said there was a technical violation,” Aoki said. Aoki needed to win three matches during the two day tournament to earn the right to face Chang in the finals. “I wrestled some really good guys and won my matches by take downs using the tilt move,” Aoki said. 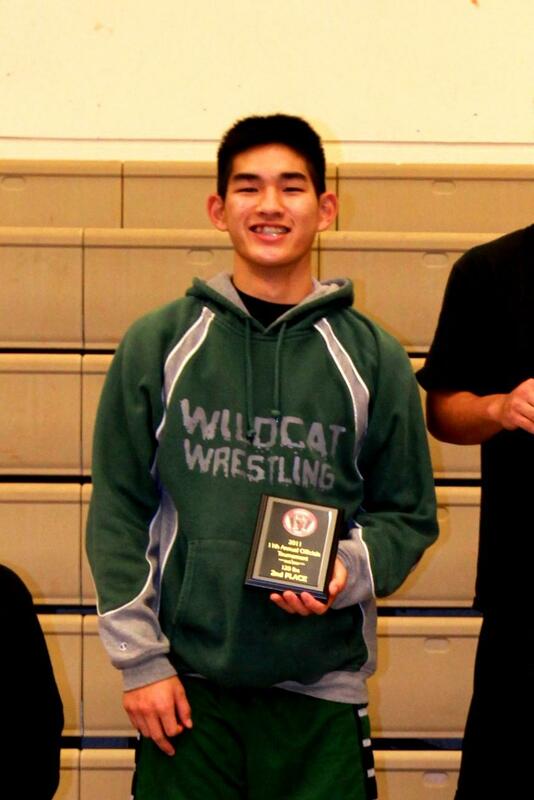 The Wildcat credited his judo experience as preparing him to be a better defensive wrestler. Quiocho had the most pressure on his back as the senior Cougar was attempting to become the first state champion in the school’s history. Standing in the way of Quiocho’s dream was Mililani’s Chase Tantog as the pair squared off on the mat. “I tried and gave it my all, so I can’t grumble,” Quiocho said of his second place medal. The Cougar lost a close battle by a 5 to 2 score and it was his second loss of the season to Tantog. Quiocho earned his way to the finals by winning three matches all in convincing fashion by scores of 16-2, 14-4 and 5-2. “I wasn’t happy after the finals match but I don’t deserve what I don’t earn,” Quiocho said. The 2010 HHSAA state champion, Kamehameha’s Megan Aina, 103, lost one match and finished third overall. Aina went for her classic chicken wing move in her attempt for the third place medal. Waiakea junior Pat Enos, 152, also claimed a third place medal by a 6-4 score in a sweet victory over Kamehameha-Kapalama’s Andrew Kahalewai who had beat him last year in the HHSAA championships third place match. Kamehameha’s Welina Tong, 175, was the biggest surprise as the first year wrestler lost only one match over the two days to claim a third place medal.